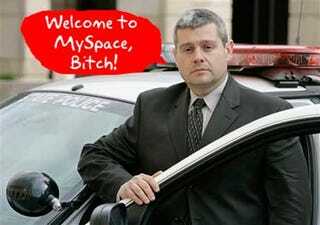 Turns out, it's a dumb idea to post "I just killed two cops" on your MySpace page. That's what some idiot did, and learned the hard way that cops are rediscovering their home computers, and hitting MySpace, Facebook and even Second Life in search of clues. Sure, there have always been the badge-wearing nerds at the back of the forensics lab who knew how to "Google" things and check the "e-mail" of bigger, dumber cops. But now other officers are wising up, according to an AP story. Homicide detectives and beat cops are going online and just poking around, and the dumbasses who think they won't get caught by blabbing on their public pages are, well, getting totally nailed. In one recent example, a detective in Newark, N.J., tracked the alleged killers of three college students by mining MySpace pages maintained by the suspects and their friends. In another, pictures and prose posted online by the killer of Taylor Behl, a 17-year-old Virginia college freshman, connected him to the victim and ended up revealing where her body was stashed.